The Royal Society and British Academy have launched a joint project on educational research, which comes with a call for evidence. The United Kingdom has a strong track record of producing excellent educational research, and using research to inform both policy and practice. In 2014, 66% of the work in education submitted to the Research Excellence Framework (REF) was rated as world-leading or internationally excellent, which is almost exactly the same proportion as for the social sciences as a whole. Furthermore, more than three quarters of the score for impact was rated as world-leading or internationally excellent. The critiques on the quality and relevance of educational research made in the 1990s by Hillage and others do not appear salient today. However, educational research capacity is under threat. There was a 15% reduction in the number of researchers submitted to the REF in 2014 when compared to the Research Assessment Exercise in 2008. Anecdotal evidence suggests that fewer early career educational researchers are graduating with PhDs and securing academic positions in UK universities: the age profile of UK educational researchers is rising and there is no obvious mechanism for securing succession. The information revolution is also making an impact on the ways both education and educational research is conducted. Massive amounts of data about education are now available for analysis, and there are new mechanisms for producing and disseminating knowledge. It is against this background that the Royal Society and British Academy project is being launched. Although restricted to science and mathematics education, these issues were identified in the Royal Society's 2014 report Vision for science and mathematics education. The scope of the current project was broadened to address all aspects of educational research, in recognition that education operates as a system, and that not all educational research is conducted by people who work in universities. Educational research is an international endeavour, and the scope of the project will include gathering evidence from other nations about the generation and use of research knowledge to inform educational policy and practice. The irony of writing a post about enhancing evidence-informed policy-making in education this week has not escaped me. Our government has just put out for consultation a Green Paper which, if implemented, will see permission given for (English) schools to reject pupils because they are not sufficiently academically able, and for funding currently spent by universities on widening participation to be diverted into university sponsorship of schools. My colleague Professor Chris Husbands, Vice-Chancellor of Sheffield Hallam University, recently blogged about grammar schools, describing the evidence suggesting that they will do the opposite of what the green paper says (i.e. grammar schools have the option to reject pupils, rather than giving parents the choice to select schools for their children; grammar schools don't address the needs of modern economies for large numbers of highly-skilled workers; it isn't possible to predict reliably attainment at 16 or 18 in tests administered at 11). Evidence about the outcomes of university sponsorship of schools is no more convincing. I am aware of excellent schools which have university sponsors (including the schools sponsored by Sheffield Hallam University) - but a quick Google search will show that there are examples of failure as well as success. What is the evidence that university sponsorship of schools leads to better outcomes than other governance arrangements? 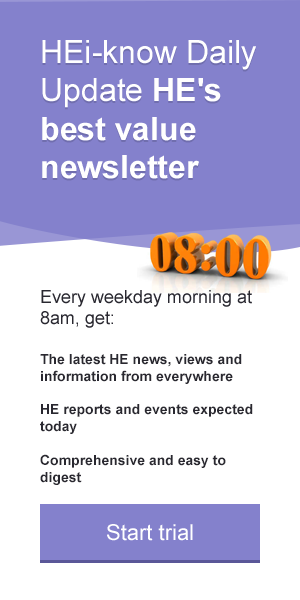 Evidence-informed education policy-making and practice needs support from those of us in the HE system. The RS and BA are championing the cause through this project. Please respond to the call for evidence.